944 pages | 333 B/W Illus. Food Engineering Handbook, Two-Volume Set provides a stimulating and up-to-date review of food engineeringphenomena. It also addresses the basic and applied principles of food engineeringmethods used in food processing operations around the world. Combining theory with a practical, hands-on approach, this set examines the thermophysical properties and modeling of selectedprocesses such as chilling, freezing, and dehydration, and covers the key aspects of food engineering, from mass and heat transfer to steam and boilers, heat exchangers, diffusion, and absorption. 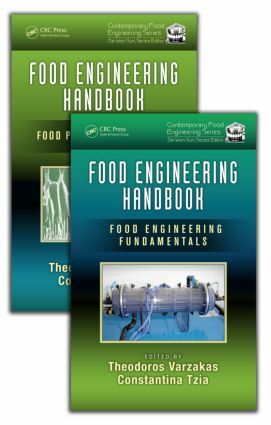 Presenting cutting-edge information on new and emerging food engineeringprocesses, Food Engineering Handbook, Two-Volume Set offers a complete reference on the fundamental concepts, modeling, quality, safety, and technologies associated with food engineering and processing operations today. Fluid Mechanics in Food Process Engineering; Ricardo D. Andrade P., Carmen E. Pérez C., and German J. Narvaez G.
Theodoros Varzakas received a bachelor’s degree in microbiology and biochemistry, MBA in food, and Ph.D in food biotechnology from Reading University, UK in 1992 and 1998, respectively. He has been a postdoctoral researcher at Reading University, worked in large pharmaceutical and multinational food companies in Greece, and possesses at least 14 years of experience in the public sector. Since 2005, he has served as an assistant and associate professor in the Department of Food Technology at the Technological Educational Institute of Peloponnese, Greece (Higher Institute of Kalamata, Greece), specializing in issues of food technology, food processing, food quality, and safety. Constantina Tzia received a diploma in chemical engineering and a Ph.D in food engineering from the National Technical University of Athens, Greece in 1977 and 1987, respectively. His current research interests include quality and safety (HACCP) of foods, sensory evaluation, fats and oil, dairy and bakery technology, and utilization of food by-products. Professor Tzia’s work has been widely published and presented, appearing in prestigious publications such as the Journal of Food Science, LWT - Food Science and Technology, Innovative Food Science and Emerging Technologies, Food and Bioprocess Technology, and Journal of the American Oil Chemists' Society.